The texture of this prawn fritter is different from what I have at the Ngo Hiang stall. It is very crispy but the crust is slightly hard whereas the one sold at Ngo Hiang stall is softer but less crispy and it tends to be very oily. This home-made one is not. I made 12 fritters and they were all gone in no time. Overall I think this is a good try for my maiden attempt. I will omit the ground turmeric next time, as I do not like the yellow colour crust. 1) Sift the flour, baking powder, turmeric and salt into a mixing bowl. Add water and stir to make a fairly thick batter. Then add the chives and bean sprouts, and stir to mix. 2) Heat the oil in a small saucepan over medium heat. Insert a heatproof, long spatula (metal is the best) into the hot oil to heat it up. 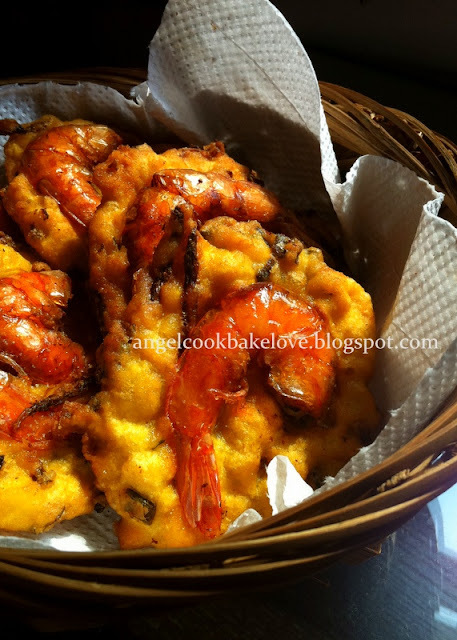 Add one scoop of batter on the spatula, lightly flatten by the back of the spoon and press 1 or 2 prawns into the batter. 3) Deep fry in hot oil with the spatula for about 1 min then use another spatula/tong to remove the fritter from the spatula (at this point of time the fritter should be easily removed, just need to push lightly. If the fritter still sticks on the spatula, just deep-fry with the spatula for a while more. Do not force to remove else the fritter will be out of shape). 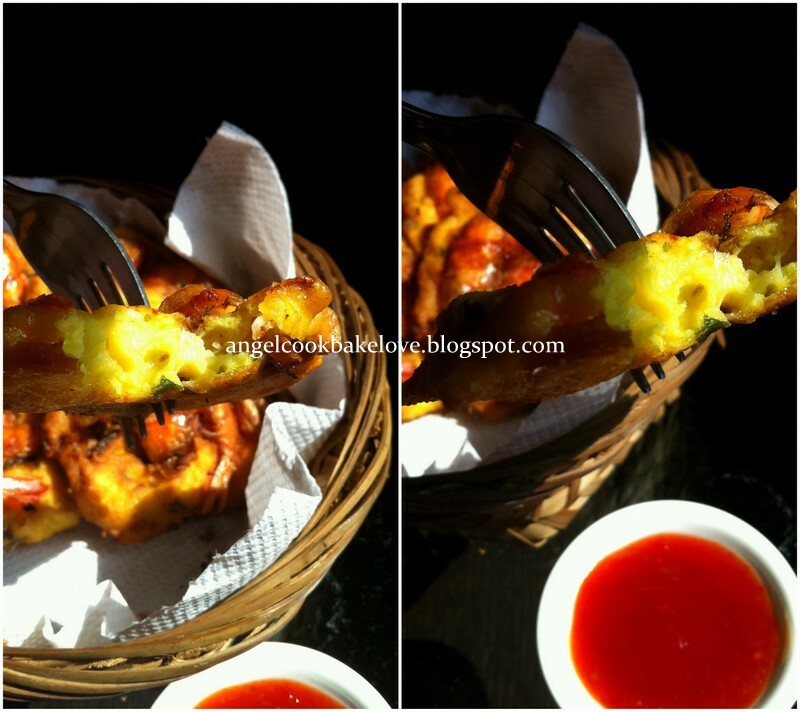 Continue to fry the fritter in hot oil till golden brown. Repeat until all the batter is used up. 4) Serve warm with sweet chili sauce. I really like your prawn fritters. Its making me hungry. I could eat a few of those with lots of chilli sauce. Yummy! Thanks. Me too. I like to dip with chili sauce. Very very very nice.... I want to try this one day. I love this very much....!! Look so yummy! Must make this for my hubby, he loves this very much. Thanks. Try it and let me know the verdict. I like to eat cucur...normally I will make cucur corn.Taste good also. Cucur corn good idea! I like anything with corn. 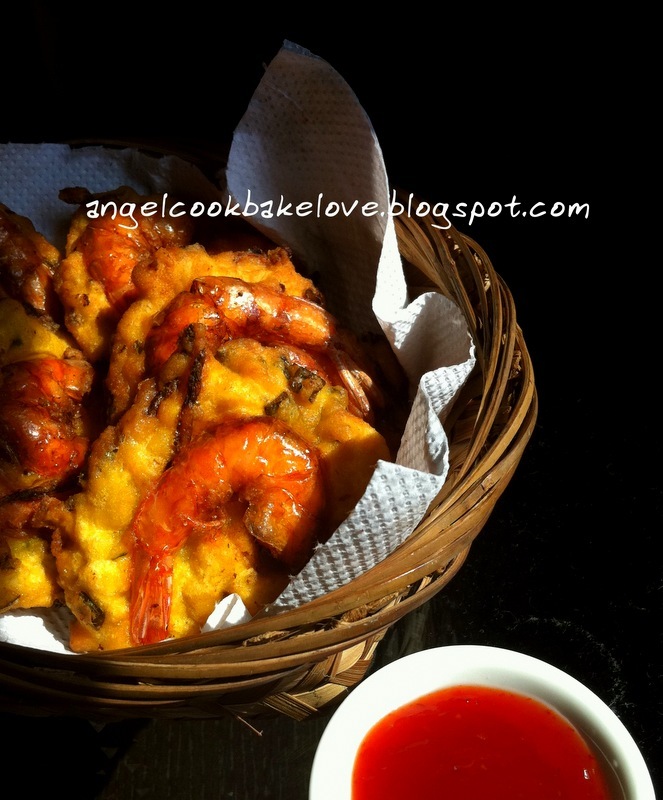 The other i just make this, i just use small shrimps...your with big prawn sound so good!